We’re often looking for examples of good, and not so good, practice in ecommerce for our reports and articles, and there are a few sites you can generally rely on for the former. One of these in AO.com, formerly Appliances Online. The company was launched 14 years ago and its recent IPO valued it at around £1.6bn. A key reason behind the company’s growth can be found in its focus on good design and customer experience, as well as a culture of testing and optimisation. Free delivery works. It removes the concern about costs from the customer’s mind and simplifies the purchase decision. More importantly, AO.com displays this delivery proposition very effectively and prominently. On every page, it shows free delivery at the top of the page, as well as in search results and on product pages. It also offers premium delivery options so that users can have items shipped the same day, or within a nominated time slot. These options are more expensive, but customers are often prepared to pay for the convenience. Offering a range of options and prices ensures that AO.com covers most customer concerns around delivery. Indeed, our Multichannel Retail Survey, carried out in September 2013, found that 50% had abandoned purchases due to a paucity of delivery options. Have you ever abandoned an online purchase due to lack of delivery options? This is a great example of an ‘about us’ page which explains the company’s proposition and commitment to customer experience. It also smartly integrates its social channels. A page like this is important for a retailer like AO.com which, at least until recently, may have been unfamiliar to many customers. Alongside delivery, returns is another key concern for potential customers. Can they return items if they’re not quite right? How? Will it cost much? AO.com eases these concerns with a no fuss, and no cost returns policy. AO.com uses autocomplete for its site search, which reduces the chances of customers hitting zero results pages, as well as giving them a gentle help with spelling. It also uses the search box for merchandising, in this case displaying its most popular dishwashers. 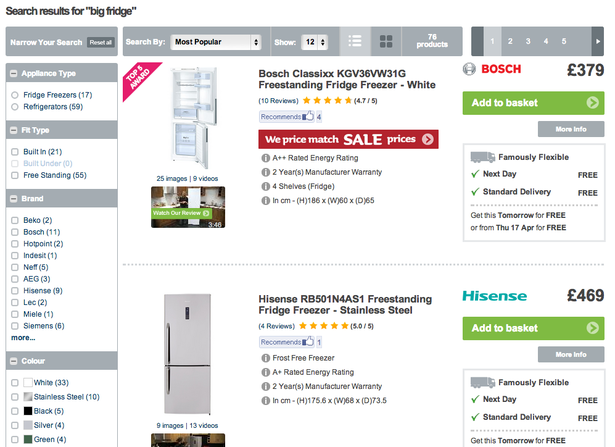 AO.com deals with the search term ‘big fridge’ effectively, by narrowing results to fridges of 1.3m or higher. After this, the display of results and use of filters and sorting options is exemplary. Customers can narrow their search by just about every product characteristic you can think of – colour, energy rating, review score etc – while offering options for viewing results. The product previews are excellent too. A quick summary of key features, social proof in the form of reviews and Facebook recommendations, and a reminder of AO’s compelling delivery proposition. Much information around electrical products is baffling to the average consumer. This means they need help in deciphering the technical terms, and a way to answer the simple question of why one dishwasher is better then another, or why it may be worth paying an extra £100 for. AO.com answers such questions in a number of ways. Firstly, with s summary of key aspects that are likely to be of concern for customers, like running costs and noise levels. Meanwhile, a quick summary from AO’s experts helps to explain the product’s benefits. There’s also a handy comparison table, which allows a side by side comparison of key features, review scores and more. Social proof works, and this site is brimming with it. It’s there on almost every page. AO has enjoyed some success on Facebook, reaching 1m+ fans/likes in a couple of years. It uses this effectively on product pages too, with testimonials from customers. It’s also there on the homepage, with reviews and customer testimonials. Many of the product pages feature detailed video reviews of the products by AO staff. This allows customers to see the workings of the items in a way which would be impossible through static images alone. Also, the fact that these videos are made by the AO team lends them extra credibility when compared with manufacturer’s videos. Trust is important, and AO.com has signed up for Google’s Certified Shops scheme. This is verified by Google and shows stats on customer service, delivery success rates, as well as offering protection for customers. This is not the only way the site conveys trust though. Along with the aforementioned social proof examples, and the reassurances about returns, there’s a persistent contact number throughout the site. AO.com doesn’t feel the need to display trustmarks throughout checkout, instead relying on good design to convey trust. We just see a single padlock and ‘secure’ message on the call to action. It’s a one page checkout, which is relatively unusual, but this one is designed very well indeed. One benefit is that customers are ushered straight to checkout from the basket page. No registration required here, and no barriers to getting on with the payment. Things are explained very clearly, shortcuts like postcode finders are used effectively, while features like delivery date selection are well designed and very easy to use. The attention to detail is impressive too. You can choose an ‘eco-delivery day’, which means that AO.com is already delivering in the area and will thus save an extra trip. AO.com appreciates that buying an electrical appliance can be a big purchase for many customers, one which will require a little thought and time spent researching. It offers to email the basket to customers for future reference, which also allows them to market to these customers. It’s one thing having reviews of products, but it’s the presentation and effective use of this information which really makes the difference. AO.com is smart enough not to restrict its use of reviews to product pages alone. It uses them around the site, including in its filtered navigation. It uses them very effectively on product pages though. Many products have 100+ ratings, which need effective organisation to help customers to make sense of them. The summary scores for different aspects of products (quietness, capacity etc) are a smart way to help people make sense of reviews, as are the quick pros and cons. Customers can have too many choices at times, and sites need to help them to narrow the choices to find the most suitable ones for them. Filtered navigation is one way to do this, and as described earlier in this article, it’s something AO does very effectively. Another way is to help users to choose by pre-selecting the best products for them. Here, AO.com picks the best products and allows customers to browse the top five lists. I could go on, but I won’t. The point here is that AO.com has focused on providing an excellent customer experience, from providing a usable site to ensuring that it meets customer expectations around delivery and returns. This has helped the company to grow, and outdo more established rivals in the electrical sector. Perhaps most importantly, AO.com has tested and improved its site over the years, listening to customer feedback and results of tests and applying the lessons. Profit margins determine whether businesses sink or swim and this is especially true in the hypercompetitive ecommerce industry. So what can retailers do to improve profit margins? On Monday 12th May at our Marketing Automation Forum, the last session of the day involved all tables (each a mix of job roles from many different sectors) battling it out in our website segmentation/personalisation game. By this time the audience was already warmed up by some great sessions including one from Econsultancy’s very own Heather Hopkins on “The changing market place – marketing automation means more than just email”.